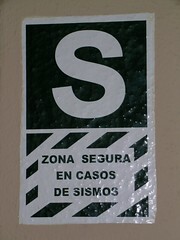 This sign was fixed to the wall in between two rooms of our Lima hotel, and I think roughly translates as "secure zone in case of earthquakes". Always good to know these things. So now we've crossed to the other side of South America, to Peru. I'm afraid we haven't got any exciting photos as we've been wasting a couple of days doing sweet FA in Lima, which is fine because there's not a lot to do in Lima other than eat, drink and spend hours abusing the free internet at our hotel. But tonight we board a sleeper bus bound for the Andean town of Arequipa, which sits beneath the shadow of the El Misti volcano, and is also near the two deepest canyons in the world (take THAT Grand Canyon).